Jazz up your Patio Parties with an Outdoor Patio Bar! Are you planning on throwing any patio parties this year? An outdoor bar can be an excellent addition if you have sufficient space on your patio. Outdoor bars are highly in vogue these days and are preferred not only by the bar owners, but it is also the preferred choice of households. Nothing can be more refreshing than relaxing on your patio and enjoying a glass of wine amidst the fresh air. If you plan to throw a wine party or a cocktail evening to enjoy with your family and friends, an outdoor bar is an ideal companion for your patio for spring, summer and fall. If you are planning to host a sophisticated patio party for your friends, make sure that you add a stylish outdoor bar set to your deck or patio to give it the right ambience. Patio bars are available in a wide array of designs and colors so that you can choose the best pattern and shade to suit the theme of your patio. Outdoor bar sets are also available in a variety of materials. You can choose bar sets made of wrought iron, teak outdoor bar sets, rattan bar sets, all-weather wicker outdoor bar sets and patio bar sets made of eucalyptus wood. If you are hosting a beach theme party, a tiki bar set will be an ideal addition to your garden or terrace. Usually, outdoor bar sets consist of a bar, a bar table along with bar stools. Some patio bar sets include accessories like drink cabinets and mini refrigerators. Portable patio bar sets are also available so that they can be easily removed as per your convenience. This elegant patio bar set by Beliani is ideal for both commercial and domestic use. 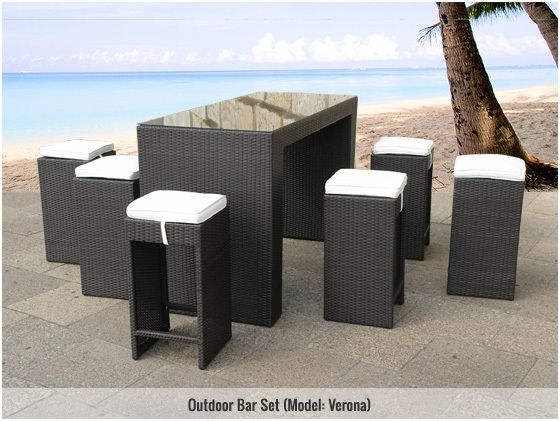 This outdoor bar set consists of a dark brown wicker with 6 chairs and a tempered glass top. This comfortable bar set is spacious enough for your entire family as well as friends. Your guests would love to sit and relax at the patio bar while enjoying drinks. The all-weather wicker furniture is made with a powder coated aluminum frame. The cushions are specially coated so that liquids can be wiped away easily. Beliani is known for its high-quality patio furniture that is ideal for the Canadian weather. This environmentally friendly bar set by Beliani is rust free and can be used in any season as it is weatherproof and resistant to dirt, mold and ultraviolet rays. Time to set up your outdoor space and have some fun!